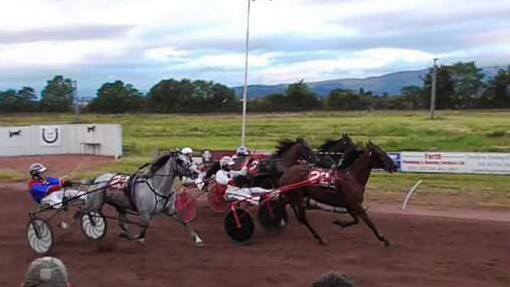 The harness racing train keeps on rolling after an epic weekend in Aberystwyth with meetings at Corbiewood, York, Binchester and Allensmore on Thursday, Saturday and Sunday respectively. Corbiewood's meeting on Thursday featured the third leg of the Oakwood Stud Mares Pacing Series and for the first time in the series saw the race fully subscribed with both English contenders present. The write up I did for Harnesslink can be found here. 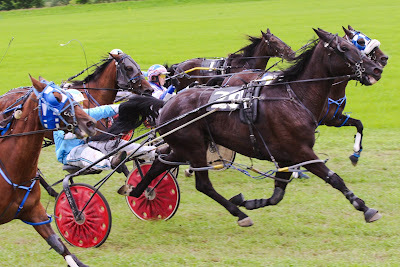 Once again it was a race which was won in the closing yards, with a blanket finish across the full width of the track. Loriznitestar, who has now raced in all of the legs to date, finally returned to the form which saw her winning the STAGBI Future Broodmares race earlier in the season at Corbiewood. It was very much welcomed by the owners, Tam Sneddon and Lynne Elvin, and after the race trainer Paul Cullen said of the mare, after two below-par performances in the first two legs, that 'Loriz' was 'a typical woman'...I don't know what he meant by that, but I was faux-affronted at the comment!! So that makes three different winners for the first three legs, and with the entries for this week's racing now published, it is guaranteed that the winner of the fourth leg will be a different mare again, as none of the previous winners have entered. The prize money is being shared fairly and everyone is getting their turn! This is shaping up to be a proper series with a really exciting final on the 10th August (a race I'm unfortunately going to miss due to personal commitments). Stay tuned for plenty of promo material in the build up to that grand finale! The other race I just want to touch upon is the one which Valentine Camden won for my friend George Carson. The week before we were enjoying the success of GDs Baby and then out of nowhere comes Val flying around the last bend four wide and storming home to victory. 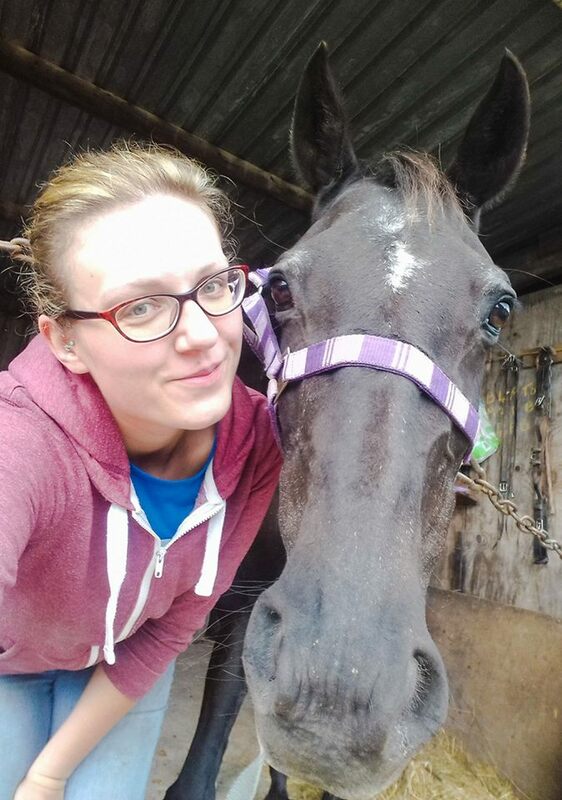 I've mentioned it before but Val used to belong to my friend Emma Langford down in Wales and I feel as though I have a personal connection to the horse seeing as George and I endured a 25-hour round trip to collect both him and my old mare Smokey in April 2016! Once you've been through that, it changes you as a person, and as a group we are inextricably linked! Speaking of Smokey, my little old mare had to come up to the stables at the end of last week after Smarty's daily checks of the fields found her to be lame with a suspected abscess. She didn't half look every minute of her 23 years when she hobbled off the lorry into the stable and I had to start that thought process of what happens 'when the time comes'. Call me over-dramatic if you like, but nobody has any idea what this horse means to me. Anyway, Saturday morning before we left for York, the Jockey and I dug the abscess out and I soaked her hoof before spraying the cavity and putting her back on box rest. There was definitely an immediate improvement and by the time we returned on Sunday night she was a different horse in terms of her attitude! I forgot how much of a little madam she can be! On Monday night I took her out for some exercise, however the planned walk around the track and a nibble of the grass turned into me putting her in the lunging pen and leaving her to her own devices - for a horse so advanced in years, she can definitely still motor and I made the executive decision that I didn't want to be half-dragged around our track! Now that she's walking almost sound again, and also feeling better in herself, she doesn't really look so old and I think I can put the 'when the time comes' conversation to the back of my mind for a while longer yet. As the opportunity was there, I decided to measure her with the measuring stick my parents got me for Christmas a couple of years ago. I'm able to measure horses almost to the centimetre without a stick, having been taught a useful trick by my dad many years ago. And as you'll know, Smarty and the Gaffer have no idea about height and claim their horses are all 15'1hh. So the stick has come in quite handy in recent times (OK, so Eternal Flame and Wild Bill Hickok are both 15'1hh, but Cassius Clay is 16'1hh so that theory goes out of the window, and Ace is 15'2hh). When I first owned Smokey, when she was 8 and I was 13, she was 14'3hh. She was the perfect height for my dad and me (6' and 5'11'' respectively) to ride (note: I find people tend to ride horses that are too big; Star is 15'3hh and definitely as big a horse as I'll ever need to ride). The day that I unloaded Smokey off George's box at our place, Smarty laughed and asked me why I'd brought a pony home. I vehemently defended her size, claiming she was 14'3hh and that was that, it was just that she's finer boned and less chunky than Dark Velvet (who is also 14'3hh) so looked smaller. She is, at a push, 14'1hh. I therefore own a Standardbred pony. She definitely wasn't that small first time around! If I sat on her now (having not grown taller since I was 13), I'd squish her. 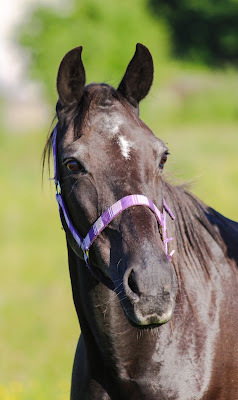 Anyway, enough about an old mare (kidding, I could never talk about her enough, she's the reason I'm here right now, writing this - true story). On Saturday we went to York for an eight-race card staged in glorious sunshine. Once again I was back on photographer duties (you can see photos of the race winners here). I particularly enjoyed the performance from Hollieoaks, it was nice to see a female 1-2 with Greentree Serenity finishing second. The aged Le Trot race for non-winners featured an exciting finish between Show Business and Titan De Prelong, with the former coming out on top. The two-year-old pace also featured a close finish, with Rhyds Star Quality getting up in the shadow of the line three wide for driver Mick Lord with the fillies Brown Eyed Girl and Scappa Hanover filling the minor placings. Smarty and I stopped overnight at Scotch Corner so as to avoid driving all the way home to Central Scotland just to come back down to Co Durham for Binchester the following day. Kudos to Hugh and Michael O'Neil who travelled from Ayr to York on Saturday to watch the racing, then back to Ayr on Saturday night, then at the last minute deciding to drive back down to Binchester on Sunday to support friend George Carson who had two runners. That's some dedication to racing! Last year saw the first ever meeting at Binchester, a meeting which I enjoyed thoroughly and which saw the ill-fated Arts Pace Hill pace a mile in 2.00.8 as a three-year-old. Binchester is a 5/8 grass track and as we were so early in arriving (probably for the first time in our joint history - we are more often the last people to a meeting than the first people) I took a walk around the track. It's remarkable how good a track it is. It's like a bowling green. As for the racing...first class. Super competitive with a number of close finishes. Only one odds-on winner all day (stepping down in class of race after finishing second at Aberystwyth last time out). The Nicholson family cleared up, with John Snr winning the first heat on Check Me Out and a maiden race on Laneside Legend. He also qualified Firestarter for the final when finishing second behind son, John Jnr on board All Fired Up. 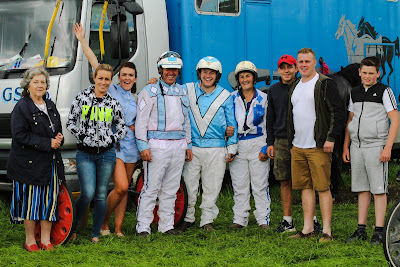 This meant the stable had 3 runners in the 8-horse final, and mum, Georgina, had to don her colours to join the line up. Alexis Laidler fielded the two fancied horses, heat 3 and 4 winners respectively, Ayr Major and Rhyds Solution (owned by Julie Sedgewick, owner of the field the track was situated on), both of which were involved at the business end of things in the final. As the field passed me, sat on top of Graham Smith's pick-up taking photos at the 50 yard marker, any one of five horses was in with a massive chance, and it was John Nicholson Jnr and All Fired Up who got up by a neck from William Greenhorn and Ayr Major to land the final. Claire Bousfield and Mispantastic finished a head behind in third, with Rhyds Solution overcoming a massive trail of 70 yards to finish fourth, a head behind Mispantastic. Long time leader Check Me Out and John Nicholson Snr were only a short distance behind in fifth. Coloured pacer Busking Boy was an all-the-way winner for young Jak Foody in the maiden & novice combined, with Brywins Beach Baby and Andrew Cairns winning convincingly in the maiden pace. For the second year in a row, the meeting was not as well supported by harness racing regulars and the general public as I hoped and expected. Twelve months ago I offered to help with promotional material in the build up to the meeting for getting out and about in the local area - that offer still stands. As for getting racing people there, all I can do is appeal to you to consider it. Plenty of Scottish people are travelling across the border, with and without horses, because we can see the potential the track has, and it is supported by local owners, trainers and drivers, but I expected to see more faces, more people paying through the gate to support a solid meeting on a fantastic track. Use it or lose it folks! Before I head off to start writing up about Corbiewood and the fourth leg of the Oakwood Stud Mares Series (because I am that behind with this post), and start packing for a weekend of racing at Tir Prince and Wolsingham, I just have to raise a serious question about things that seem to be going missing. At first it was just one minor thing, but then it was another, and another, and before I knew it, loads of things were just disappearing and nobody was talking about them anymore. So if anybody has seen or heard anything about the following, please let me know. There's a carpet, which although restricted in available space, does still have some room for things to be swept under it. Integrity test results and explanations on BHRC website - there is still an outstanding test result which is showing up as blank next to a horse's name on the BHRC website...from the end of May. Now, I know the reason for this (it's nothing sinister), but an explanation to licence holders in general hasn't been forthcoming which simply leads to speculation and false accusations from everyone all over social media. That's wholly unfair on owners and trainers in my opinion. A simple explanation as to the delays in publishing results (OR don't publish any results until all results are received back for a specific day) would shift the spotlight from the connections of horses back onto the BHRC though, and that probably isn't the desired outcome. Status: MISSING. Other than that, all's good! Well, it's not, but I can't really talk about any more negative stuff because I've probably already pushed it too far this week. Rest assured though that for every ounce of rubbish stuff that goes on, the good people of this sport produce ten times the amount of memories and fun and joy and laughter and leave me 100% convinced that good will win in the end. You all know who you are.